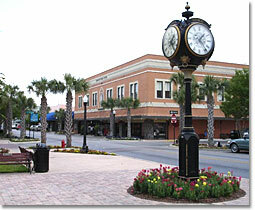 Although Leesburg is situated in the far western part of Lake County, it is in many ways the center or hub of activity. Perched atop Lake Wales Ridge, Leesburg attracts both the traditional retiree and the urban refugee escaping the hectic pace of the big city. The economy, once solely based upon agriculture, has become more diverse, anchored by a first-class airport, and industrial parks, as well as new business incentive programs and fast track permitting to encourage new business investment. Leesburg's location, between two of Lake County's largest bodies of water, Lake Griffin and Lake Harris, make it no small wonder that boating and fishing are the two most popular pastimes for Leesburg residents. Newcomers are often delighted to find that Lake County's largest city has a downtown area that is a treat to the eye with its recently completed multi-million dollar streetscape project. The picturesque downtown is lined with old historical buildings, park benches, quaint little restaurants, gift shops, antique stores and businesses to meet the needs of both residents and visitors alike. 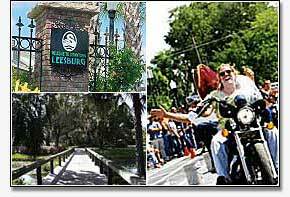 The City was named as a Florida Main Street City in 1994 when the Downtown Business Association, the City of Leesburg and the Chamber of Commerce formed the Leesburg Partnership in a united effort to preserve the town's heritage. The Leesburg Partnership has assisted in the City's revitalization projects by hosting many public events and festivals which include Mardi Gras Street Party, the Mardi Gras Ball, the Christmas Parade, the Main Street Christmas Stoll, and the famous Leesburg Bikefest, to name just a few.